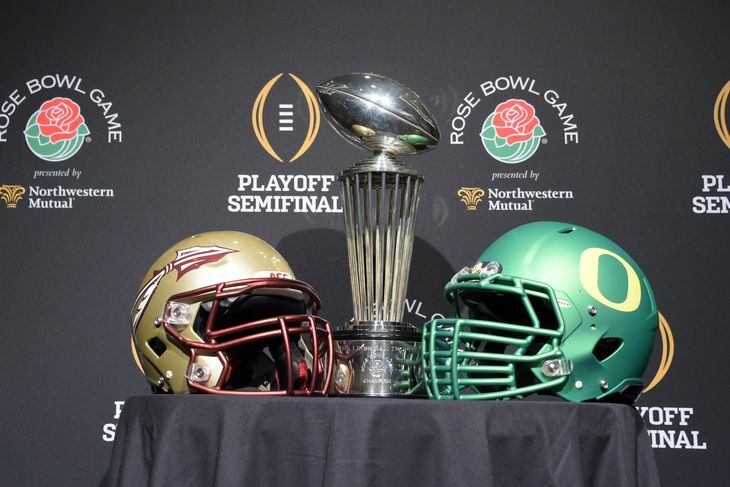 Florida State’s 59-20 blowout loss to Oregon in the College Football Playoff semifinal shows that it belonged in the Top 4 as much as Bill Gates at an Apple convention—and that an undefeated regular season, even for a Power Five program, shouldn’t mean an automatic playoff berth. It also proves that, get this, everyone was right when they said TCU deserved to get in. It just so happened that it should have been over the defending national champs and winners of 29 straight—not Ohio State, the team that lost to Virginia Tech in Week 2. You see, it shouldn’t have been a surprise to watch Florida State implode in the second half after being down 18-13 through the first 30 minutes of action. The Seminoles had been in this situation nine times before—an alarming stat in itself—so it’d be easy to say that they were a second-half team, but instead of coming back and winning dramatically like they were “supposed to,” they folded and gave up because they realized their opponent wasn’t anything like they’ve seen all year. Florida State wasn’t ready; it hadn’t been battle tested. And it by no means had the resume to feel comfortable matching up with Oregon heading into the game. The ‘Noles won 13 games by an average of 11.8 points per game before their embarrassing playoff debut, including 25- and 40-point wins against The Citadel and Wake Forest. But that “they just win” mantra and “game control we didn’t lose” stat can finally be tossed aside, because obviously neither played as a factor versus the Ducks. Leading up to January, FSU’s best win was a 37-35 squeaker in the ACC Championship Game over a Georgia Tech squad that had struggled with Wofford, Tulane, and Georgia Southern, while losing to both Duke (at home) and North Carolina. If you put them all together, its opponents average out to rank No. 48, per CBS Sports’ current 1-128 FBS rankings. Excluding The Citadel, they have a 82-69 record, but that’s not what should have been a giant red flag; it’s the fact that Florida State struggled against the inferior and never put together a quality performance. You also have to include the fact that last season, Jameis Winston played like a Heisman Trophy winner. This season, he played like an average sophomore quarterback that turned the ball over far too often and made some big plays here and there to get his team out of holes that he put it in time and time again throughout the year. Let’s be real. Be real with yourself, FSU fans. Everyone reading this, be real. Florida State wasn’t Top-4 quality. The author of this bandwagon hack piece graduated in 2010! Go get some experience and learns to write an informed opinion for yourself. I really have to wonder about the validity of non-biased reporting at BR when they permit an article so poorly written and one-sided as this to occur. Oregon utterly dismantled FSU. They didn’t turn the ball over. Oregon took it. Dargen, Buckner, and the rest. Love Jimbo but he’s in denial if he doesn’t think the tempo figured into it. FSU’s D-line was sucking wind on the sideline by the second quarter. Pingback: Ranking the 5 Best Big 12 Games of 2014 - Today's "U"